Cédric H. David (PI), Konstantinos M. Andreadis (Co-I), R. Edward Beighley (Co-I), James S. Famiglietti (Co-I), Aaron A. Boone (Collaborator), Vincent Fortin (Collaborator), Hyungjun Kim (Collaborator), Ernesto Rodriguez (Collaborator), and Dai Yamazaki (Collaborator). Figure 1: The largest rivers and lakes/reservoirs of the Mississippi Basin that should be seen by SWOT and the 14 gauges currently located on the main stems, highlighting the sparseness of current observations, from David et al. [201x]. SWOT should provide a ratio of 1000/1 more spatial information than currently available. The Surface Water and Ocean Topography (SWOT) Mission [Alsdorf et al., 2007a, 2007b] is tentatively scheduled for launch in 2021 and is expected to provide unprecedented observations of width, height and slope for the largest terrestrial water bodies, from space. The characteristics of the main SWOT instrument have been well studied [e.g. Enjolras and Rodriguez, 2009] and the relative contribution to terrestrial hydrology of SWOT never-seen observations compared to in situ observations of lakes [Biancamaria et al., 2010] and rivers [Pavelsky et al., 2014] have been quantified. However, the waterscape features that SWOT should unveil at sub-monthly resolution and continental to global scales remain a mystery. Worse, we yet have to fully characterize these variations at such large scales (Figure 1). Particularly, current observing capabilities are not able to reveal the spatial features of flow wave propagation [David et al., 2011]. A new generation of continental to global scale hydrologic and hydrodynamic (“hydro”) models has been under development for the past two decades [Bates and De Roo, 2000; Beighley et al., 2009; Kouwen, 2010; David et al., 2011; Yamazaki et al., 2011; Decharme et al., 2012]. Such models can help us describe, before launch, the waxing and waning of surface water bodies that we expect to see with SWOT. Given the lack of existing SWOT-like observations at continental to global scales, macroscale hydro models are currently our best way of estimating the spatiotemporal variations of surface water features that should be observed by SWOT at continental scale and at sub-monthly time steps. The SWOT Hydrology Simulator could then be used to characterize the measurement capabilities, although such large-scale applications of the simulator have yet to be implemented. Additionally, one could hope that the unprecedented observations will help improving our understanding and modeling capabilities for the global terrestrial water cycle and of the climate system. However, while the direct observations of SWOT over global landmasses should provide never-seen terrestrial water gradients at sub-monthly and at 10-100m resolutions, there will remain spatiotemporal gaps between SWOT retrievals. The ability of SWOT land measurements to directly contribute to our understanding of terrestrial hydrology and of the climate system will therefore likely be demonstrated through their integration within models. Of particular interest are global climate models, and specifically their land hydrology components. We argue in this proposal that, before launch, the SWOT Science team ought to be able to describe the continental scale sub-monthly waterscape gradients that SWOT should see on land, characterize the measurement capabilities of such features, and recommend on best ways to assimilate data into models. We plan to build on ongoing research in several institutions to establish an international collaboration that will focus on understanding the best integration methods between expected SWOT terrestrial retrievals and existing global hydrologic/hydrodynamic models. The primary objectives of this proposal are to shed light on the expected SWOT observations at continental to global scale and to investigate the integration of SWOT measurements into a series of global hydrologic models. We will establish a SWOT-friendly continental-to-global scale modeling framework and focus our analysis using six hydro models applied over four continental-scale river basins spanning various climate zones and driving hydrologic processes. Our research will characterize the ability of SWOT terrestrial observations to contribute to the understanding of the terrestrial hydrologic cycle (with impacts on the climate system) and expose the details of how much SWOT data and hydrologic/hydrodynamic models can accomplish when working hand in hand. How can we best prepare for the expected SWOT continental to global measurements before SWOT even flies? That is, how can we understand the relationships between existing surface water variations and expected SWOT large-scale observing capabilities? The combination of outputs from the SWOT hydrology simulator at continental scale (or alternatives, see Section 1.3.1) and the inter-model, intra-model and multi-forcing variability within hydrologic/hydrodynamic models will provide guidance. What is the added value of including SWOT terrestrial measurements into global hydro models for enhancing our understanding of the terrestrial water cycle and the climate system? Are current global hydrologic models ready to ingest expected SWOT data? What SWOT variable(s) or SWOT-derived product(s) offer the best promise for integration and for data assimilation? The comparison and the integration of simulations from the SWOT hydrology simulator (or alternatives) into large-scale hydro models will inform on such capabilities. We will combine an inter-comparison framework (Figure 2) consisting of a series of six horizontal water transfer schemes: CaMa-Flood [Yamazaki et al., 2011], HRR [Beighley et al., 2009], ISBA-TRIP [Oki and Sud, 1998; Decharme et al., 2012], LISFLOOD-FP [De Roo et al., 2000; Neal et al., 2012], RAPID [David et al., 2011], and WATFLOOD [Kouwen, 2010]. These models will be fed by runoff produced by the four land surface models of NASA's Global Land Data Assimilation System [Rodell et al., 2004]. Figure 2. Design of the hydrologic and hydrodynamic model inter-comparison. Our analysis will focus on four continental-scale river basins located across climatic zones, with distinct hydrological challenges, and subject to various levels of anthropogenic influence (Figure 3). The river basins will be that of the Amazon, Mississippi, Niger, and Saint Lawrence. The Mississippi Basin spans climate zones varying from cold to wet to semi- arid and contains 8 of the 15 largest US lakes and reservoirs. The Amazon Basin is hot and humid and subject to regular flooding. The Niger River flows through a large semi-arid region and is also subject to annual flooding within the complex inner-delta region. The Saint-Lawrence Basin is located in a cold climate and includes the five American Great Lakes. These basins are selected for their hydrological challenges, but also in order to leverage past and ongoing studies by team members, hence minimizing the burden of data gathering and pre-processing (e.g. basin delineation, downloading and formatting observations, preparing river networks). The inter- comparison will be informed by a series of existing studies. Co-I Beighley and Collaborator Yamazaki both have experience with the Amazon Basin [Beighley et al., 2009; Yamazaki et al., 2012]. PI David has three studies of the Mississippi Basin [Cai et al., 2014; David et al., 2015; Tavakoly et al., 2016]. Collaborator Boone directed studies of the Niger Basin [Pedinotti et al., 2012, 2014]. Collaborator Fortin guided a study of the Lake Michigan Basin [Fry et al., 2014] that is currently being extended to the Saint Lawrence Basin. Figure 3. The largest basins studied with models: 1) the Mississippi [David et al., 201x], b) Saint- Lawrence [Fry et al., 2014], c) Niger [Pedinotti et al., 2014], d) Amazon [Beighley et al., 2009]. We expect that such inter-comparison of horizontal hydrologic/hydrodynamic models could set the foundation for a multi-model framework of surface water simulations and become as valuable for SWOT as GLDAS has been for GRACE [Rodell et al., 2009; Famiglietti et al., 2011]. The modeling approaches vary in equation complexity (advection, diffusion or both), process representation (with/without representation of flooding, with/without surface routing prior to river routing), spatial decomposition (catchment-based or grid-based), spatial resolution (varying between 5 and 50 km in computational element size), temporal resolution (daily to sub-daily), and inclusion of man-made infrastructures (i.e. reservoirs). We expect to shed light on the impact of these various modeling paradigms on simulations of width, height, slope and flow within water bodies in order to prepare for implications on SWOT retrievals. How much difference is due to the type and resolution of the modeling elements (grid/catchment)? What is the influence of the river routing method (kinematic, Muskingum, Manning) and of the surface routing method (lumped, kinematic) on simulated flow hydrographs? What is the impact of the flooding representation (w-d relationships, cross section data, topographic index) on simulated widths and heights? How large is the intra-model variability (mean, median, maximum, minimum, standard deviation) in flow quantities (width, height, slope, flow) at the continental to global scale? How large is the inter-model variability (mean, median, maximum, minimum, standard deviation) in flow quantities (width, height, slope, flow) at the continental to global scale? How large is the multi-runoff variability? That is, what is the influence of the runoff products from GLDAS models on intra- and inter- model variability? How do these variations compare with currently-available [e.g. Andreadis et al., 2013; Gleason and Smith, 2014; Yamazaki et al., 2014; Allen and Pavelsky, 2015]? We plan to analyze the impact of the variability in expected observations (width, height, slope) and derived quantities (flow) on the potential retrievals of SWOT by feeding the simulations into the SWOT hydrology simulator. Hence, the proposed work will help preparing for SWOT by exposing what SWOT should see from space. Given that each model currently produces data in varying formats, we will review each model output approach and revise the source codes to ensure consistency of files used in the inter-comparison. Allen, G.H., and T.M. Pavelsky (2015), Patterns of river width and surface area revealed by the satellite-derived North American River Width data set, Geophys. Res. Lett., 42(2), 2014GL062764, doi:10.1002/2014GL062764. Alsdorf, D.E., E. Rodriguez, and D.P. Lettenmaier (2007a), Measuring surface water from space, Rev. Geophys., 45(2). Alsdorf, D.E., E. Rodriguez, D. Lettenmaier, and J. Famiglietti (2007b), Surface Water Ocean Topography (SWOT) Mission, in Earth Science and Applications From Space: National Imperatives for the Next Decade and Beyond, pp. 354–359, National Research Council, Washington, D.C.
Andreadis, K.M., G.J.-P. Schumann, and T. Pavelsky (2013), A simple global river bankfull width and depth database, Water Resour. Res., 49(10), 7164–7168, doi:10.1002/wrcr.20440. Bates, P.D., and A.P.J. De Roo (2000), A simple raster-based model for flood inundation simulation, J. Hydrol., 236(1-2), 54–77. Beighley, R.E., K.G. Eggert, T. Dunne, Y. He, V. Gummadi, and K.L. Verdin (2009), Simulating hydrologic and hydraulic processes throughout the Amazon River Basin, Hydrol. Process., 23(8), 1221–1235, doi:10.1002/hyp.7252. Biancamaria, S., K.M. Andreadis, M. Durand, E.A. Clark, E. Rodriguez, N.M. Mognard, D.E. Alsdorf, D.P. Lettenmaier, and Y. Oudin (2010), Preliminary Characterization of SWOT Hydrology Error Budget and Global Capabilities, Sel. Top. Appl. Earth Obs. Remote Sens. IEEE J. Of, 3(1), 6–19, doi:10.1109/JSTARS.2009.2034614. Cai, X., Z.-L. Yang, C.H. David, G.-Y. Niu, and M. Rodell (2014), Hydrological evaluation of the Noah-MP land surface model for the Mississippi River Basin, J. Geophys. Res. Atmospheres, 119(1), 2013JD020792, doi:10.1002/2013JD020792. David, C.H., D.R. Maidment, G.-Y. 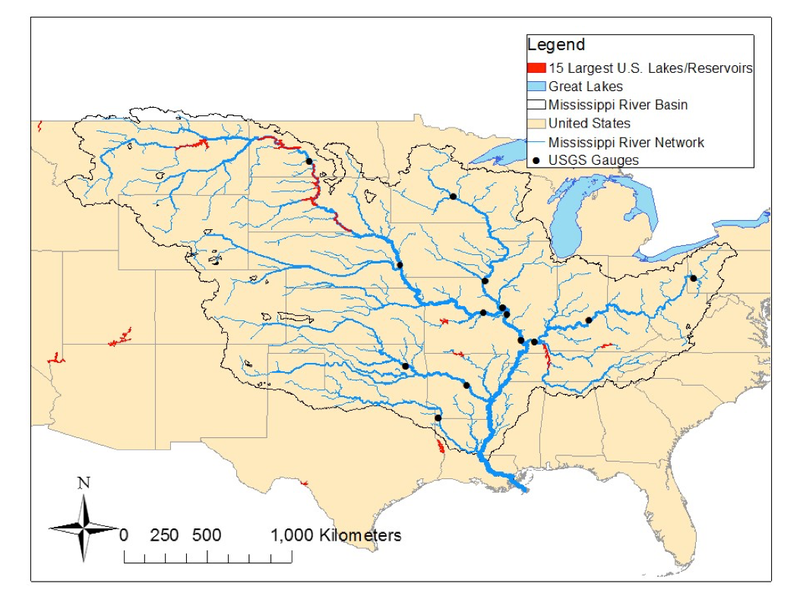 Niu, Z.-L. Yang, F. Habets, and V. Eijkhout (2011), River Network Routing on the NHDPlus Dataset, J. Hydrometeorol., 12(5), 913–934. David, C.H., J.S. Famiglietti, Z.-L. Yang, and V. Eijkhout (2015), Enhanced fixed-size parallel speedup with the Muskingum method using a trans-boundary approach and a large subbasins approximation, Water Resour. Res., 51, 1–25, doi:10.1002/2014WR016650. Decharme, B., R. Alkama, F. Papa, S. Faroux, H. Douville, and C. Prigent (2012), Global off- line evaluation of the ISBA-TRIP flood model, Clim. Dyn., 38(7-8), 1389–1412, doi:10.1007/s00382-011-1054-9. De Roo, A.P.J., C.G. Wesseling, and W.P.A. Van Deursen (2000), Physically based river basin modelling within a GIS: the LISFLOOD model, Hydrol. Process., 14(11-12), 1981–1992. Enjolras, V.M., and E. Rodriguez (2009), An Assessment of a Ka-Band Radar Interferometer Mission Accuracy Over Eurasian Rivers, Geosci. Remote Sens. IEEE Trans. On, 47(6), 1752–1765. Famiglietti, J.S., M. Lo, S.L. Ho, J. Bethune, K.J. Anderson, T.H. Syed, S.C. Swenson, C.R. de Linage, and M. Rodell (2011), Satellites measure recent rates of groundwater depletion in California's Central Valley, Geophys. Res. Lett., 38(3), L03403. Fry, L.M. et al. (2014), The Great Lakes Runoff Intercomparison Project Phase 1: Lake Michigan (GRIP-M), J. Hydrol., 519, Part D(0), 3448–3465, doi:10.1016/j.jhydrol.2014.07.021. Gleason, C.J., and L.C. Smith (2014), Toward global mapping of river discharge using satellite images and at-many-stations hydraulic geometry, Proc. Natl. Acad. Sci., 111(13), 4788–4791. Kouwen, N. (2010), WATFLOOD / WATROUTE Hydrological Model Routing & Flow Forecasting System, Department of Civil Engineering, University of Waterloo, Waterloo, ON, Canada. Neal, J., G. Schumann, and P. Bates (2012), A subgrid channel model for simulating river hydraulics and floodplain inundation over large and data sparse areas, Water Resour. Res., 48(11), W11506, doi:10.1029/2012WR012514. Oki, T., and Y.C. Sud (1998), Design of Total Runoff Integrating Pathways (TRIP) - A Global River Channel Network, Earth Interact., 2(1), 1–35. Pavelsky, T.M., M.T. Durand, K.M. Andreadis, R.E. Beighley, R.C.D. Paiva, G.H. Allen, and Z.F. Miller (2014), Assessing the potential global extent of SWOT river discharge observations, J. Hydrol., 519, Part B(0), 1516–1525, doi:10.1016/j.jhydrol.2014.08.044. Pedinotti, V., A. Boone, B. Decharme, J.F. Crétaux, N. Mognard, G. Panthou, F. Papa, and B.A. Tanimoun (2012), Evaluation of the ISBA-TRIP continental hydrologic system over the Niger basin using in situ and satellite derived datasets, Hydrol Earth Syst Sci, 16(6), 1745–1773, doi:10.5194/hess-16-1745-2012. Pedinotti, V., A. Boone, S. Ricci, S. Biancamaria, and N. Mognard (2014), Assimilation of satellite data to optimize large-scale hydrological model parameters: a case study for the SWOT mission, Hydrol Earth Syst Sci, 18(11), 4485–4507, doi:10.5194/hess- 18-4485-2014. Rodell, M. et al. (2004), The Global Land Data Assimilation System, Bull. Am. Meteorol. Soc., 85(3), 381–394. Rodell, M., I. Velicogna, and J.S. Famiglietti (2009), Satellite-based estimates of groundwater depletion in India, Nature, 460(7258), 999–1002. Tavakoly, A.A., A.D. Snow, C.H. David, M.L. Follum, D.R. Maidment, and Z.-L. Yang (2016), Continental-Scale River Flow Modeling of the Mississippi River Basin Using the High-Resolution NHDPlus Dataset, J. Am. Water Resour. Assoc., Submitted on 2016- 01-27, tentatively accepted on 2016-04-05. Yamazaki, D., S. Kanae, H. Kim, and T. Oki (2011), A physically based description of floodplain inundation dynamics in a global river routing model, Water Resour. Res., 47(4), W04501. Yamazaki, D., H. Lee, D.E. Alsdorf, E. Dutra, H. Kim, S. Kanae, and T. Oki (2012), Analysis of the water level dynamics simulated by a global river model: A case study in the Amazon River, Water Resour. Res., 48(9), W09508. Yamazaki, D., F. O'Loughlin, M.A. Trigg, Z.F. Miller, T.M. Pavelsky, and P.D. Bates (2014), Development of the Global Width Database for Large Rivers, Water Resour. Res., 50(4), 3467–3480, doi:10.1002/2013WR014664.